After a massive Telegraph Ave. fire destroyed Cafe Intermezzo and Raleigh's, many feared the worst. But Oakland architect Kirk Peterson unveiled some grabby plans this week to open a tent-and-trailer version of both restaurants, potentially for the next two to three years. In a set-up that resembles something between a M.A.S.H. triage unit and the Proxy project in San Francisco, three shipping container kitchens would operate under canopy tents in the old Sequoia Building location at Telegraph and Haste. Raleigh's and Cafe Intermezzo would each run a kitchen, and an upscale pizzeria called Gabriella's (which had been in the works before the fire) would take the third shipping unit. In the proposal, all three tent restaurants would have glassed-in, greenhouse-style walls, as well as picnic tables with umbrellas outside the tents. An outdoor beer garden in San Francisco's shipping container pod has proven wildly popular; this setup could have similar allure. This project is distinguished from Proxy SF by its element of urgency, however. Proxy is more whimsical and experimental, created primarily because there's a temporary parcel of vacant commercial space. In Berkeley, the project is part of the healing process, an ad hoc solution for restaurants who can't afford to stay closed for years. A commenter on Berkeleyside, which broke the story earlier this week, pointed out that Santa Cruz businesses operated out of tents for more than two years after the earthquake in '89. Peterson just hopes Berkeley customers will give this bold concept a shot. "It's a fascinating project, but it's very hard to portend if it will have appeal," Peterson said. "I'm 60, so I don't spend a lot of time at campus hangouts; Is this something kids will like?" 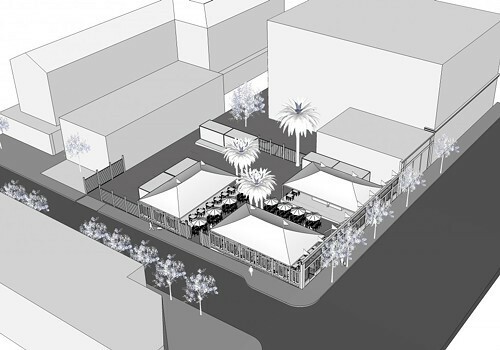 If approved by the city, the tented restaurants could be operational by May.